There have been calls to give Nora Aunor or Dolphy the National Artist award. The National Artist of the Philippines is a title given to a Filipino who made significant contributions to the development of Philippine arts. Originally, the categories under which National Artists can be recognized are Music, Dance, Theater, Visual arts, Literature, Film and Broadcast Arts, Architecture and Allied Arts. In 1997, President Ramos issued an executive order to create a new category of National Artist for History and Literature before conferring the honor to Carlos Quirino. All these categories are not original Philippine arts. These arts were only introduced to us when foreign invaders ruled our country for several years. There is one art that is originally ours and there is one person who dedicates his whole life to preserve this. Sadly, the Philippine government does not seem to care about Arnis and Cacoy Cañete. Arnis- our oldest form of art and our best preserved cultural heritage. Arnis can be traced back to Lapu-lapu when the native warriors only fought with rattan sticks, spears, and hand made swords called Kampilan. When the Spaniards began colonizing the Philippines, they saw an already-developed weapons-based martial arts practiced by the natives. After the decree prohibiting the native to carry weapons, the elite and underground practitioners maintained and kept the art alive. One thing that is known is that some of the arts were hidden from the Spaniards and passed down through familial or communal ties, usually practiced by disguising them as entertainment like with choreographed dances such as the Sakuting stick dance or during mock battles at Moro-moro stage plays. Ciriaco “Cacoy” Canete (born 8 August 1919) of Cebu Philippines is a prominent, internationally known martial artist who travels the globe to share, teach and demonstrate his martial art skills to others. Currently the Grandmaster promotes his art for self-defense, sport and personal well-being. A religious man, who has never challenged anyone, Cacoy never refused a good fight to protect his family’s Doce Pares Club and good name. He is undefeated in no-holds-barred weapon fights. His goal in martial arts is to offer confidence to those with low self-esteem, courage to the intimidated, and nurture responsibility among citizens. 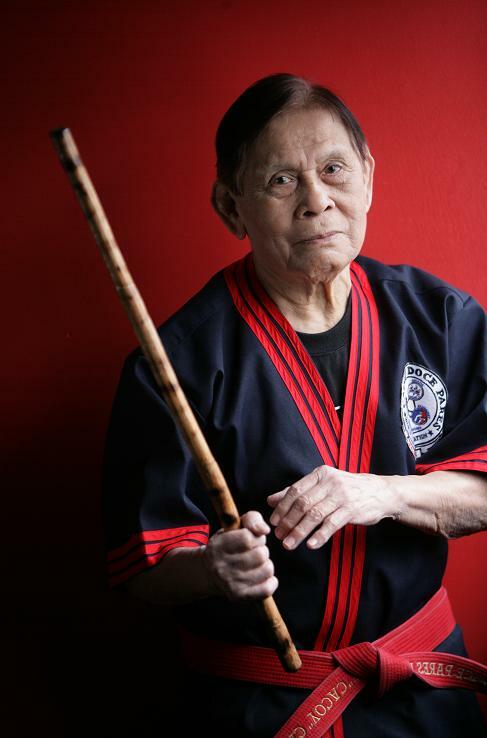 He is today the best-known of the Canete brothers (Filemon, Eulogio, Tirso, Ciriaco, Rufino and Silvestre), prime movers in the preservation and promotion of the indigenous Filipino martial art of stick fighting (eskrima-arnis). Ciriaco “Cacoy” Canete was born in San Fernando, Cebu, in 1919, into a family for whom Eskrima was already a tradition. In his youth, Cacoy trained in boxing, wrestling and the Asian martial arts. In the 1920’s his brothers were already involved in teaching stick fighting. Interest in Filipino martial arts led to the formation by Visayan martial arts practitioners of the Doce Pares Association in Cebu. In 1939, Cacoy’s elder brother, Eulogio “Yoling” Canete became president of Doce Pares, the oldest and longest standing martial arts organization in the Philippines and a driving force behind the popularization of Filipino martial arts. Yoling was president of Doce Pares until his death in 1988. Cacoy served with the USAFFE in the war years and stayed in the army service until 1947. He studied at the University of Southern Philippines and taught martial arts in various Cebu schools. In 1979 he was champion in both the First Open Arnis Tournament in Cebu City and the First National Invitational Arnis Tournament in Manila, both events sponsored by the National Arnis Association of the Philippines (Naraphil). Another Canete, Dionisio (Cacoy’s nephew) served as president of both Naraphil and the World Kali-Eskrima Arnis Federation (Wekaf), an organization founded much later in the history of Doce Pares (1987). The remarkable Cacoy Canete has been active in organizing tournaments, exhibitions and training programs in eskrima-arnis in the Philippines and foreign countries. Grandmaster Cacoy turns 93 today. Do you think he deserves the National Artist Award? Artists who enjoy broad acceptance through prestigious national and/or international recognition, awards in prestigious national and/or international events, critical acclaim and/or reviews of their works, and/or respect and esteem from peers within an artistic discipline. DOLPHY? NORA AUNOR? WHY NOT CACOY?